Years ago when young English actor Isaac Hempstead-Wright walked into the "Game of Thrones" auditions after his weekend drama school teacher told him to, little did he know how big the HBO series really was until he got older and was able to understand all the hype. Now at 17, the actor who was basically the baby of the show when he first started out at 10-years-old, is considered an adult actor in the industry with more responsibilities to take on. Of course, these include keeping secrets about the show to himself rather than divulging them to his friends. Having sat out the whole of the past season had let Isaac enjoy the show as a fan, but it also made him eager to return to the show. And boy will he be returning for a major part to play for season six! As one of the few characters with powers that are prophetic and able to inhabit another living being, what really got people off their seats was a scene in the season six "Game of Thrones" trailer which showed Bran standing on his own two feet! At HBO Asia's press junket for "Game of Thrones" season six that was held in Singapore recently, Cinema Online chatted up with the very well-spoken young actor and tried our best to get him to spill some secrets on the upcoming season! Awww. Back then, we had a young Bran Stark. 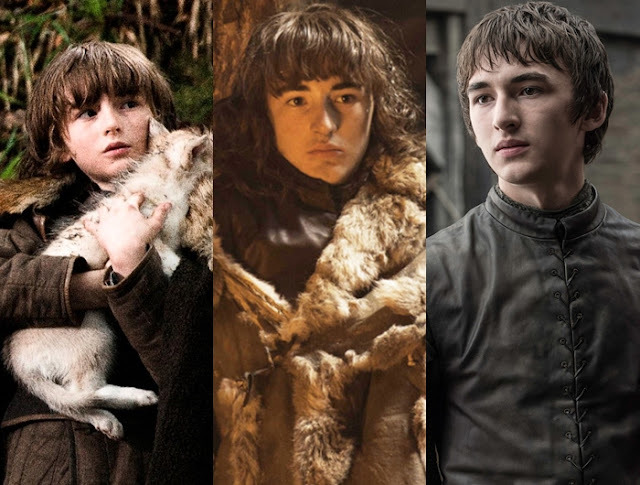 Now, Bran Stark is all grown up! Cinema Online: You were only 11-years-old when you started acting in "Game of Thrones", did your parents even allow you to watch the series then? Isaac Hempstead-Wright: At the start I definitely didn't watch it! My parents were quite protective over what I could and couldn't watch in the series. But I do watch it now. What's different with your role in season 6 as compared to the previous seasons? In season six, Bran now has a grasp of what his role is. Every character sort of knew what part they were going to play in the story, but Bran has taken a particularly long time to work out what this power is that controls him. In season five he wasn't there at all because he was training with the three-eyed raven in a cave. When we meet Bran in season six, he's still not completely well-versed with his talent, but he's now got an idea of what this power is and how it might be useful. Do you enjoy being a member of the Stark family? Yeah! Cause they're the nice ones! Everyone else is treacherous and you can honestly say you can trust a Stark with your life. That's kind of their downfall as well, sadly. What are your hopes for the Starks? I'm hoping for a reunion actually. That would be really nice! They've been through so much. But I also hope that eventually Sansa would take the throne. She's seen and been through so much of the politics. I think she has developed a thick skin and a cunning mind, which I think is what you need in order to be a leader. Sansa could be a queen! We met Isaac Hempstead-Wright at the press junket of "Game of Thrones" in Singapore. How safe do you feel for Bran in season six now that he has powers? [Laughs] No one can feel safe in "Game of Thrones". The second you do, that's when they [producers] say you're going to get killed. In the midst of all the politics and scheming, the magic elements of the show has always been in the background. It's very unique to be able to play someone who has powers. What are the limitations faced by Bran since he isn't able to walk? It's quite fun to be carried around by Hodor! Or I would always be in the sled with all these nice fur blankets. I would say there wasn't much of a challenge of not being able to walk. I literally got to sit down at the time, but Bran is a terribly vulnerable character and making that come across at times can be a slight struggle. When Bran gets a vision, do you really have to roll your eyes all the way back? I can do it a little bit! But the team actually have it all done with special effects. Since you're still in school, what's balancing work and studies like? Do you foresee yourself still acting in the future? Your co-star Jack Gleeson (King Joffrey Baratheon) announced his retirement at age 22. When I started off it didn't really register to me as acting. I would just do my part and then have fun the rest of the time. But as I've grown up in this season, and also now since I'm 16 and considered an adult, there are no more limited child acting hours and there are more responsibilities. It has really made me look at acting differently. I'll definitely carry on with it and see how it goes. I'm having a great time with it! 17-year-old Isaac Hempstead-Wright plays Bran. Do fans recognise you when you're not in costume? The last time people saw me I looked like a baby. Now I look taller with short hair and glasses, so I don't get recognised at all which is quite nice! You knew this question was coming... What do you think about the end of season five? Is Jon Snow really dead? If your character is going to be killed off, would you like to know in advance? How do the actors find out that they're going to die? The first sign would be a bottle of champagne and a bouquet of flowers from the producers delivered to the actor's dressing room. And you'd think, "Oh that's nice of them." Then shortly would come the dreaded phone call saying that you're being killed off! For season five, I got a call for in the morning from my agent saying that the producers wanted to talk to me on the phone. And I thought, "Oh no, it's over!" And I spent the whole day just thinking about that. They then called me and said "oh we just want you to sit out this season." That was really terrifying!